The Lost Iguana Resort is one of Arenal’s newest hotels. 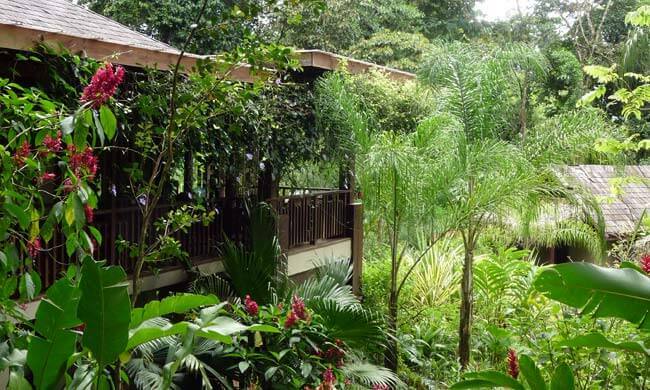 Offering luxury accommodations in the rain forest the resort’s 100-acre property overlooks the Arenal Volcano, one of the world’s most active volcanoes. A premiere, upscale retreat nestled carefully and gently in the jungle, the Lost Iguana Resort offers rooms with large private balconies overlooking the Arenal Volcano and Arenal River Gorge. The standard deluxe rooms are spacious and well appointed with first-class furnishings, artwork and full amenities (Coffee Service, mini bar, refrigerator, safe deposit box, satellite TV, AC and ceiling fans, king-sized bed or 2 full size beds with pillow-top mattresses with 100% Egyptian cotton sheets, private balcony with volcano views and more). Enjoy the Lost Iguana’s tropical open air Restaurant and Palapa Bar and the spectacular double pool with swim up bar, there you can relax in the heated upper level with sunning shelf and built in seats, or play under the waterfall in the large lower swimming area and poolside massage cabana. After spending the day exploring the miles of foot trails available at the resort or participating in any of the many activities offered nearby, enjoy an evening relaxing in your private hot tub and witness the spectacular lava flows and eruptions of the volcano.